Since my last post, life has been a whirlwind. I know my blog has been pretty much silent for the last year. Part of that time, I was in the dark room being developed, but several months ago, I emerged into a life that is colorful once again. So many things have happened this year: I ran a 5k, became a mother to two foster children, and of course, my long-time dream of publication is now coming true. 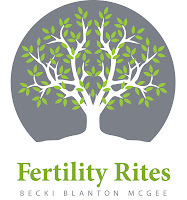 Amidst all the spinning plates, I somehow managed to meet my contract deadline and the publication of Fertility Rites is on track. Advance sales officially start on Monday, October 22nd; however, the chapbook is already available for preorder at www.finishinglinepress.com. Just click on "Preorder Forthcoming Titles" on the right-hand side of the page. The books are listed alphabetically by title and Fertility Rites is listed on the second page. Preordered copies of the book are supposed to ship on February 1st. Unfortunately, they don't have a thumbnail image of the cover up yet, but hopefully, it will be on Monday. I'm posting the image of the front cover here so you can see what it looks like. The cover was designed by Tonya Leigh Morgan who also designed the Versions of Chai logo. Once again, she has taken my wisp of a concept and turned into much more than I ever thought it would be. She is a very talented artist and I am truly blessed to call her my friend. In addition to Tonya, there are others whose help has been invaluable to me on this project. First of all, none of this would be possible without the support and encouragement of my husband, writer and illustrator Rick McGee. I know I can face anything with him by my side. Over the next few days, my blog posts will honor Rick and some of the other writers who have supported me: Julie Hensley, Lisa Karon Richardson, Katerina Stoykova-Klemer, and Eric Scott Sutherland. To the few followers of my blog, you may wonder what has happened to some of my previous posts. As you know, I had posted rough drafts of several of the chapbook poems along with commentary. The poems themselves have been removed, but the commentary remains. If you want to read the poems in their final versions, you will have to buy the book!